valgozi wrote: Thinking that the row may not have any benefit until after 60mins is also a bummer. It will be difficult for me to see this without live data (not sure what dropping extra tests in after 60min might do to the workout) but the AeT breakpoint for me could actually be later than 60mins, say it was 85mins then this mornings row only had benefit (apart from being able to sit on a erg for longer) for 5 mins. I am hoping to see a drop at 60mins tomorrow but if like Friday there isn't, it means the breakpoint is after 60mins. Can I add I see nothing in my HR that suggests I am clearing lactate faster than making it, HR just seems to tick along. I am personally not 100% convinced that this is the _only_ way for _everybody_ but if you believe that, would there be ways to smuggle long low intensity exercise into your normal life? Long walks? Become more active outside the training hours? Do the groceries on the bicycle? sander wrote: I am personally not 100% convinced that this is the _only_ way but if you believe that, would there be ways to smuggle long low intensity exercise into your normal life? Long walks? Become more active outside the training hours? Do the groceries on the bicycle? It's not the only way, for time restricted weeks the Threshold/Sweet Spot will have more "bang for your buck". Especially if the break point doesn't move even after training correctly. If breakpoint is always at 60mins for me training for only 60mins there would then be no training effect with what I did in the row I did this morning. Ben Redman's blog link says these rows can be mixed in with the other higher intensity rows, it doesn't have to be an either or. I am also a bad example, because my fitness is not great it seems that this occurs at intensities that would be "Long walks doing the groceries on the bicycle" kind of thing. In highly trained elite athletes Ben Redman's blog link says that this isn't the case they are still training where their lactates drop (although that blog gets lactates wrong 1.5-2.0) but will be going fast. "Walking on a tread mill" as quoted in the blog wouldn't be high enough intensity to illicit enough of a response to again give a training effect. Ways I could fit in more volume would be commute to work by bike, with the winter English weather and lack of cycle paths in the UK I think for now the ergo will do Also again the "long low intensity exercise into your normal life" would also need to be long enough to get a good training response, so past your break point. In a few weeks I shall schedule in a second long row in a day to see how long it takes to get to break point in these. I am definitely a believer in polarized training, and I think that a good way to ensure that the LIT part of training is at an appropriate intensity is by measuring lactates. Having said that, I get concerned about labeling things "right" or "wrong". I think that is why having a forum like this one is really valuable because there is so much variation in physiology. It is even more valuable because just about all of the high quality research is on elite athletes, not master age group athletes. I've come to the conclusion that lactates are a valuable indicator, but only a part of the equation. Because of the chance for measurement error, plus the influence of temperature, humidity, accumulated fatigue, needing to poop, bad music, and whatever else you have, the exact same training power can yield significantly different lactate values for me from day to day. 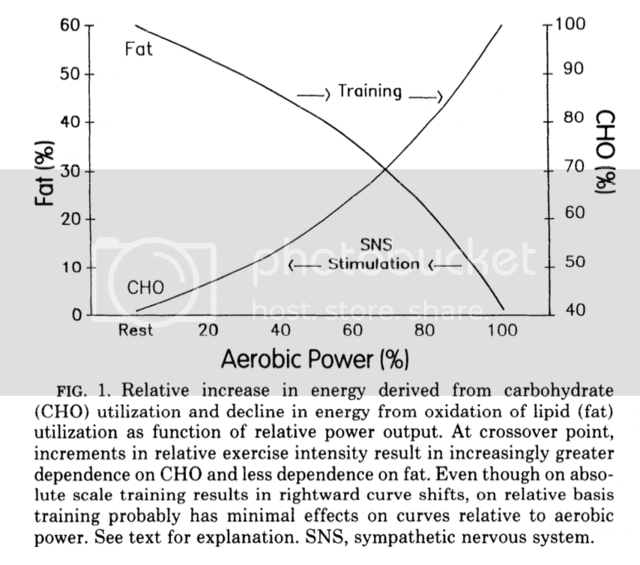 For Sander, training at a power that yields higher than 1.5mmol/l might not be sustainable. For me, training at a power that reliably yields lower than 1.5mmol/l may not be possible. I think to figure this stuff out, it requires tracking progress over time. But how to measure progress. I guess the key thing is race results, but other tests can be used, as can measures like watts at a specific lactate level. Watts at lactate is good, but the probability of measurement error can't be ignored, and the day to day variation needs to be accounted for. Having said all that, I think it might be good for us to discuss the topic of steady state intensity. I've done a lot of reading, but I am still not sure I understand it. Here is the question in a nutshell. What is the training power and duration that will result in the highest sustainable rate of improvement in aerobic performance? In one corner, you have the idea that you need to work at a power that is low enough so that metabolism is entirely fat based. Based on the paper by Brooks that defined the idea of fat to CHO crossover, I'm not sure that this concept is true unless you are on a very low carbohydrate diet. In this figure it basically shows that CHO respiration starts as soon as you are not at rest. Lactate accumulation is avoided by the lactate respiration process. So, the way I had interpreted the stuff that I've read is that you should give this system plenty to do. Basically, you are training the lactate respiration system to handle higher loads of lactate. The indicator is being able to hold a steady lactate level at or around the resting level over a long endurance session. What is the basis to want to have the lactate level much lower than that? I guess my simplistic assumption is that the absolute level of lactate can vary from person to person. The hypothesis being that I am a person with a big lactate sink, I need to open the tap quite hard to even get a decent level. So my 2.0 mmol/L is something else than yours. In my understanding Greg has been doing (trying to do) his steady state at a level where the flat part of the curve ends and lactate starts to increase "rapidly" with power. I use quotes because I also believe that the steepness varies from person to person. For me it looks like my level could be 200W, which on average gives me 1.0 - 1.5 mmol/L (at least based on past 2 weeks experience). Maybe 200W is too much. The criterium is quite simple. I want to be able to do my hard sessions as quality sessions. Now that I have established some confidence in my measurement results and have a feel for the accuracy, I like the lactate meter. It's a fun toy and a valuable addition to heart rate and "perceived level of exertion". At the least it makes those boring steady state sessions a bit more interesting. So with "every athlete being a case study" we masters rowers need to think very hard about what our body (as opposed to the average body) is doing at different intensities and what that means in terms of training effect. To complicate matters more, training history (both near history - what you have done in the past weeks and months - and far history - what kind of exercise you did when you were growing, say between 12 and 22 years of age) has a profound effect. I think this thread is an excellent way to exchange thoughts that help us form our own case studies. I also think that the good news is that there ways to measure progress, like a standard workout or an erg test, and combined with training diary information ("Yes I did this 2k 10 seconds slower than a few month's ago, but I am at the end of a heavy week and I have a head cold.") it should give you a feel for where you should go next with your training. When you stagnate, you change something, and perhaps the fact that you change something is more important than in what direction you change. I have a lot of little indicators that tell me that I should be able to do some PB after a light week and I will definitely start working down the nonathlon list soon. No rocket science, but just observing how my trainings go, how much energy I have to train, how my weekly average increases etc. End of September I have tweaked my winter training plan, compared to last winter's. Added some systematic strength work. Added some light recovery sessions (on the bike to and from work). Perhaps the improvements are a result of that. Perhaps I could have improved more if I had made different changes. I don't know when this ends, but when it ends I will stop and think. And change something. I will definitely not go back to rojabo, although a rojabo-like week would be fun for a change. Also I have seen masters rowers at my club burn out in a few months by doing too many intervals, and too much weight training on a less than solid aerobic base. Finally, my personal experience has been that going to the fast, high rate stuff too early in the OTW season is fun but it is very hard to stay fast during the entire April to September time frame. A solid base with speed work for the important races seems the way to go. A few other things. To do a good 6k, you have to do a few 6k trials. Same for 2k, and 1k. You can theoretically have the perfectly prepared body but you have to prepare the mind as well. You have to feel the leg burn at 500m in and know that 5 strokes later the aerobic pathway kicks in at full speed and things actually become easier. Most people (and especially me) handle down much earlier than they run out of energy. There is no Grant Unified Theory of training, but what I have written above are some of the beliefs that I have and try to apply in my training. Finally, I believe you have to take what you read on the internet with a lot of skepticism (including the words you are currently reading). I have more faith in peer reviewed studies than in fitness gurus who sell books. I have even more faith that successful trainers who get results with elite athletes know what they are doing, so I tend to read their books instead of those of the fitness gurus. The problem of course is that what works for the elite does not work for you or me, who most probably have a very different genetic disposition. So we have to become our own trainers. I have just ordered the book "Plannen, periodiseren, bijsturen en winnen" by Jan Olbrecht. It's an older book from 1997. I am thrilled to read about a topic I am interested in, which is written in my native language by a successful swimming coach. gregsmith01748 wrote: What is the basis to want to have the lactate level much lower than that? I am looking for lactate to drop from my resting levels so the fat utilization is working well (optimally maybe too strong in my case)?! This is then training the very base of the pyramid isn't it? I have expected this to happen since I started lactate training in an interpretation of it that I had in my head. I have always highlighted when I did see a drop from a higher number after 20mins to a lower one after 60mins this is something I always aimed for when adjusting my watts. It always seemed to stop at what is my resting. Until re-reading Boris I had missed the bit about dropping below resting. For me dropping below resting just happens to be at these lower lactate levels. But Boris did say for most they would be lower numbers. I am not eating any differently than I have been for the last year. I just had lunch and it was cous cous and turkey breast with some tomatoes so not many carbs there. Bad to admit this but my dinner last night was not too healthy, burger and chips loads of carbs. I still had a resting of 1.1mmol this morning, during the 90min row it went down from there although I suspect at 60min my pee stop it may have been at its highest then. Will see if it can be replicated tomorrow minus the pee stop. Boris outlined in quite detail (on page 12 of this thread) why you'd want to have lactates that drop from resting in SS rows. I have to say just above AeT worked for me in a taper week last week, that wasn't on purpose I was trying to find AeT. I think below AeT would have worked even better, but legs and lungs worked well for the race on Saturday so can not complain. For me the 90k+ I did last week SS between 1.5 and 2.0mmol would have been too much along side the two 30mins rows (one a PB) to have performed at the weekend. If anyone tries a below AeT row I would be interested to see where your breakpoints are? Breakpoint I believe this term should be called the 'Boris Breakpoint' I'd like him to give a full description on it if he comes back. My understanding is its where your lactate is used faster than produced so you go below your resting lactate levels. Going off of only 2 readings it appears to be around 60mins. I assume this is the case because it takes a while for me to get warmed. Means these rows will have to be looooooooong to optimally train as Boris said. sander wrote: I like the lactate meter. It's a fun toy and a valuable addition to heart rate and "perceived level of exertion". At the least it makes those boring steady state sessions a bit more interesting. I just found some research that is on point. If what we want to do is maximize fat metabolism in endurance workouts, it looks like we have a pretty wide window to drive through. 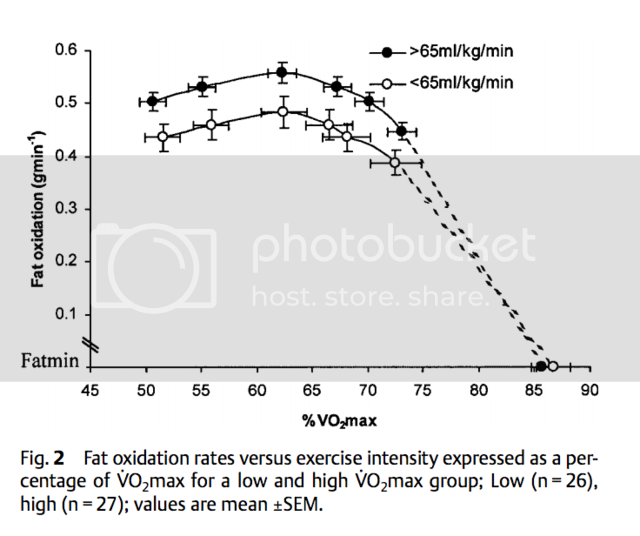 So, maximum fat metabolism occurs between 55% and 65% of VO2max power. So, from that research, that would say that I should be working between 178W and 210W. That is a HUGE range, and the curve is pretty flat between 50% and 75%. So, I don't think that the key thing is trying to maximize fat metabolism. I think it is to balance accumulated muscular fatigue and lactate accumulation. In Sander's case, his ability to metabolize lactate is fantastic and pushing hard enough to get 2.0 might be too intense. In my case, the ability to generate lactate is pretty good, but I don't clear it as quickly. Could this mean that training plans for me and Sander should be different? Should I be working on more endurance and Sander working more on strength and anaerobic performance? In other words, are we best served by working towards some single "ideal", or is it better to understand differences and individualize. gregsmith01748 wrote: I just found some research that is on point. If what we want to do is maximize fat metabolism in endurance workouts, it looks like we have a pretty wide window to drive through. Clicked on the link and misread the title as " Maximal Fat Oxidation During Exercise in Mad Men"
Regarding the lactate drop after starting to exercise, I have always thought that that was due to the slow start of the aerobic system? From a cold start, it takes 2-3 minutes for your heart rate to reach the plateau. I thought that during those 2-3 minutes one's lactate level increases, but then as the aerobic pathway is at steady speed, lactate starts to be cleared away again. When doing a step test, one has both the "warming up" effect and the fact that each step is at a higher intensity, i.e. a different equilibrium of the different pathways. So, I agree that lactate will initially rise and then fall over the course of the first few minutes of exercise (maybe even 10 or 20 minutes). I am not sure what the physiological reason for a drop in lactates beyond that time. My understanding is that you will preferentially use slow twitch muscles (which are better at fat metabolism) preferentially at these lower intensities, but eventually, as these muscles fatigue, if you maintain the same power, you will begin to recruit more and more fast twitch muscle fibers and this will eventually cause lactates to rise. If you exercise at lower intensities, you may extend the amount of time it takes before you begin this process which means you could maintain a low lactate level for a longer time. By a strange coincidence, that is the working title of a paper that I'm secretly working on! Talks about lactate, about measuring athletes, about polarized training ... what do we want more? I don't like when presentations change what Z1-Z7 are. I see it change 3 times. One having Z1-7, one Z1-3 and one Z1-6. If only it talked about mature athletes instead of these upstart kids! Seriously, it is a very good presentation. I forgive them for that as it comes from guys who have proven results. I think they are presenting research from different sources. Actually, the presentation has references to it. sander wrote: I forgive them for that as it comes from guys who have proven results. I think they are presenting research from different sources. Actually, the presentation has references to it. Greg - I have a little request, next time you are doing a 4 x 20mins could you test at 60mins and 80mins? I am interested to see if there is a drop between 60mins and 80mins for you. If you have ever done this could you link me to the results? Stelph - I did a threshold row at 2.6% HR drift there is no way my lactates could have been low as HR was up near 190 and I was working quite hard (for me). I did tune up the wattage as the row went on but I did the same on the one a week before but that was up at >6% drift. This is the first row that I have seen where lactate would have been over 2.0mmol but HR drift below 5%. Sure. I have one scheduled for tomorrow morning. I'll let you know what I get. So, not 60 to 80 minute comparison. I'll try again on Sunday. But I have a question for all you polarizers. If I am trying to do a 80/20 plan, what is a 80% of? I can think of three ways that I could measure something like 80% of my training. I think that the right way to do this is by minutes at power. I used to do it by minutes at HR, but I think that might underestimate the amount of high intensity training because of HR lag. Edit: I just looked over my past two weeks of training and using the minutes at power breakdown, I am doing way too much high intensity. 9 hours of LIT and 4:42 of threshold. I think I need to delete one threshold session per week. You know I have slightly different target percentages, but recovery and light endurance should be above 75% in my plan. I calculate minutes based on perceived intensity, and I take the entire session duration. So a 8x500m session is calculated as 60 minutes of intensive including warming up, cooling down and paddling in the rest periods. Ok so he generally uses HR's but does say lactate is gold standard. I have a few thoughts on how my training has gone this week just trying to put them all together and will post soon. It would also be nice to get some facts and maybe a few more weeks of training before I post. sander wrote: You know I have slightly different target percentages, but recovery and light endurance should be above 75% in my plan. valgozi wrote: Ok so he generally uses HR's but does say lactate is gold standard. So from your point of view it would be time at lactate? I don't know how to do that since lactate tests require time and money which disrupt the workout. By the way, I do think those were wise words from Joe friel. I need to ease up on the endurance pieces. It has been an interesting week for me, steady-state wise. I decided to try out the 200W level. Tuesday: Morning cycle to work and evening 3x20' session at 200W. This felt very hard and unsustainable and the lactate looked like it: 2.5 mmol/L after 60 minute. I guess Tuesday was just a difficult day, not fully recovered from teh 4x2km. I kind of expected today to be the same, with DOMS from the running, but everything was fine. Perceived effort is a very good indicator for me. Between Tuesday (2.5 mmol/L) and Friday (1.5 mmol/L), average heart rate and heart rate drift were very similar, but during the 2.5 mmol/L row I knew I was in trouble. Friday and today were a completely different story. Need to watch recovery in my training plan. It doesn't make sense to stick to the 200W strictly when I feel I have not fully recovered from a hard session on the previous day. I will use 1.5 mmol/L as my marker level, i.e. I will not increase the steady state power until my training is systematically well under 1.5 mmol/L. Other guys on this thread use 2.0 but I believe that is too hard for me. I think your three points are right on. And it's always to a challenge to get it right when you throw travel into the mix. valgozi wrote: Stelph - I did a threshold row at 2.6% HR drift there is no way my lactates could have been low as HR was up near 190 and I was working quite hard (for me). I did tune up the wattage as the row went on but I did the same on the one a week before but that was up at >6% drift. This is the first row that I have seen where lactate would have been over 2.0mmol but HR drift below 5%.